In this post will use Superboot made by Vache and Shreps to gain root access on Android devices. Not only Superboot can do Rooting against the Android Devices, but still much more to do, such as RootGenius (english), iRoot, KingRoot, MobileGo, Kingoroot, One Click Root, and SRSRoot, these tools are designed to perform several functions such as rooting, flash ROM, flash Kernel, Remove Ads in Apps, Booster Device, Uninstall Preinsstaled Apps, Remove bloatware, Unlock Screen, Download ROM and others. Download and extract S520_Root_via_Superboot.zip file on your computer. Then run the (root_s520.cmd) on your computer and follow the instructions. After running the script, your device will go into Fastboot mode, waiting and press "enter" when told to "Press any key to continue"
If the driver everything is OK, then you should to flash the kernel in the console, you should see the following and then the phone should boot into the system, do not press unless you enter your pin (if there is) and does not unlock the phone, then press the space bar, the window console, you can see that the script does not find the file SU and error - it's okay, do not pay attention, press spacebar. 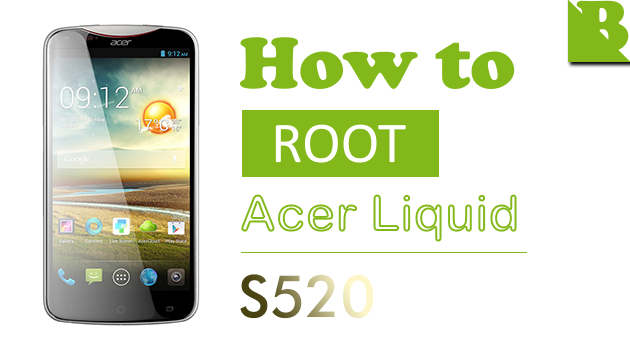 Optional: You can also verify whether you have successfully Rooted Acer Liquid S2 (S520) or not using the Root Checker app. 0 Response to "How To Root Acer Liquid S2 (S520) Use Superboot"